I used blanched carrots, blanched string beans, blanched purple cabbage, blanched sugar snap peas, cooked potatoes (purple and yellow waxy), raw red bell pepper, and raw tomatoes. Just lay the thinly sliced beef (brought to room temperature) on top. Put all of the ingredients in a food processor and process until well combined but still bumpy looking. *I put a star by lime juice and chili because I forgot to write down exactly how much lime juice I used and spiciness should be adjusted to your taste. Also note that I did not put salt and pepper because I usually season the salad itself with kosher salt and freshly ground pepper, right before you pour the dresing on. Normally, I don’t like a lot of dressing on salad, but Gado Gado dressing is meant to be generously poured on. posted by jessica	at 09:42 AM	Filed under Fusion, Recipes. You can follow any responses to this entry through the RSS 2.0 feed. Both comments and pings are currently closed. 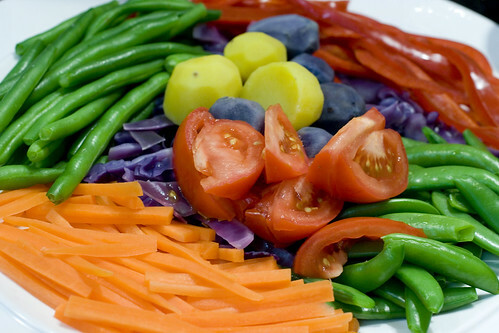 Beautiful photo with the colorful veggies! 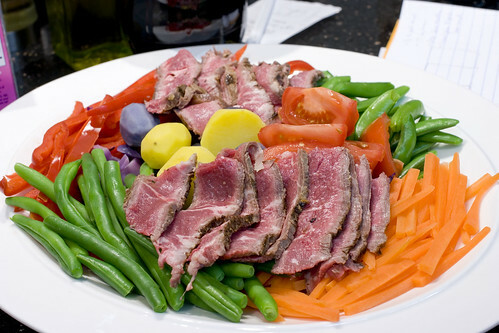 Another option for leftover beef is Thai beef salad, or Yum Neuah- see the most recent entry but one on my blog for a recipe! i love that first colorful photo! what a stunning display of color! 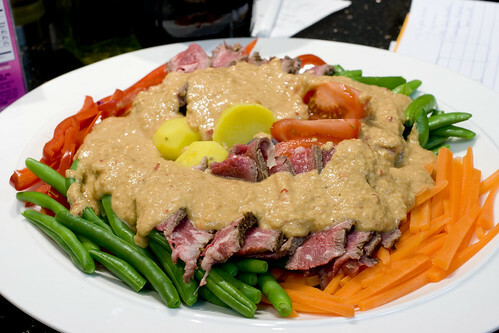 gado gado is simply fun to say, and that dressing looks ridiculously thick and satisfying. beautiful dish, jessica! Hey! I saw that photo on TasteSpotting! That’s awesome!